Today brings us another photo from the old family photo album. This is Margaret "Maggie" Scott Grow, my great-great-grandmother. Maggie was born February 11, 1848, in her family home in Sumter County, South Carolina. She grew up rather privileged in a large plantation home. Late in the Civil War, her family had a front row seat to the action as they could see the smoke from the burning of Columbia. When Sherman's army came through the area, her parents buried their belongings and had her hide in the swamp with the servants until the Yankees passed. After the war, the family resumed their life as normally as possible. The Scott family was in the habit of inviting local seminarians to their home for parties throughout the year. It was at one of these gatherings that Maggie met Jacob Grow, a student and veteran cavalryman from Georgia. They were wed at the Mt. Zion Presbyterian Church in November of 1872. Jacob served as what was known as a home missionary, serving in struggling Presbyterian churches in the frontier towns of the South. They lived in Alligator (now Lake City), Florida; Jefferson, Georgia; Sulphur Springs, Texas; and a bunch of little towns in Texas like Llano, Burnet, Comanche, Dublin, Hamilton, and Brownwood, Texas. While in Brownwood, in addition to church pastor, he was Vice President of Daniel Baker College (now Howard Payne University). The family was living in Gainesville, Texas, when Jacob died in 1903. Jacob would often preach at multiple churches on Sunday morning, riding from church to church, so Maggie would perform many of the duties at their home church including lighting the fire to power the church organ, welcoming people and playing music to occupy time until Jacob would arrive. Maggie had five children: Paoli, Mary, Willie, Elmira, and Marguerite. Paoli became a baptist minister, Mary was my great-grandmother, and Willie was a salesman. Elmira died at age 7. There is a tender family scrapbook of all of Elmira's drawings that still exists. Elmira was born when Maggie was 35. They weren't expecting any more children, but Marguerite came along as a surprise when Maggie was almost 45. Marguerite was only 11 when her father died and she never married. She lived with her mother until she was old enough to get a job as a school teacher and then lived mostly at her place of work. For years, she was the Latin teacher at the Hockaday School for Girls in Dallas. 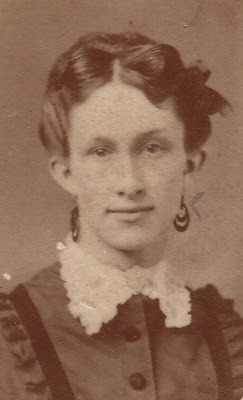 From about 1910 until her death in 1926, Maggie lived with my great-grandmother Mary and her family. My own grandmother remembered her quite well and passed along many Maggie's stories to me before she died. My grandmother said that Maggie was always very in love with Jacob and missed him until her death, not in a sad way, but in fond remembrance. Such lovliness in form and mien. Whose aim is sure e’en when ‘tis slow. Whenever he her words did hear. As he’d ne’er felt until that night. His heart was sad, he scarce knew why. To one he thought so kind and true. Her form still lingered in his sight. His thoughts from her he could not take. The flame that then did break his rest. The night of Happy New Year’s day. I see Jacob Grow was from Georgia and Galusha Grow from PA. But the question still poses itself: are you related to Galusha Grow? All these glimpses of people from the past have been fascinating! What a beautiful story and poem! Can I see some family resemblance between Maggie and you? thanks for the family story. I wish I knew a hundreth of what you know about your ancestors. What a gift! Astrocrabpuff, since Maggie lived with my grandmother's family I heard many sweet stories of Jacob and Maggie. They've always interested me. Virgil, good observation. Jacob and Galusha were both Grows, but those two were actually third cousins once removed. Which means that Galusha and I would be third cousins, 5 times removed. El, if you have the time, I'd write down what you already know and start talking to older people in your family. I've found that tracing the family history makes me appreciate all history even more. It's been a fun hobby. Thank you for your kind advice, Nate. The short answer is 'tooooooooo late' - I'm now the oldest of all. and aunts would be as short and empty as the above. Sad, but I'm ok with it. Hope to leave a bit more behind for my children.